Well I’m going to be on the radio, and I don’t mean sitting on it. You’ll be able to hear my voice and everything! And it’s radio on the Internet which probably isn’t even called radio, but I’m old, so give me a break. 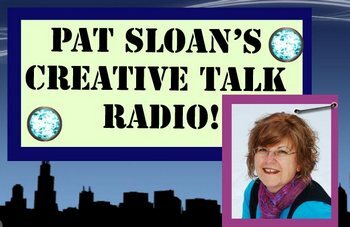 I’m going to be interviewed by Pat Sloan on her Creative Talk Network. You can listen to me live “on air” starting at 4pm EST on Monday, October 25th. If you can’t listen live then you can listen to the recording afterwards. You can even download it to your iPod. Isn’t life grand? Hey, remember the television set? It was black and white! What ever shall we talk about? If there’s something you want me to try and work in, put it in the comment section below. Tell your friends. Way cool! I can get this on the internet at the link you posted. I think they mean EDT, not EST. Not a problem, can check back later. And the recorded version will be there for a while. Will be listening for you. What is an ipod? Is it like a radio? I still listen to the radio and do not have an ipod. How far behind the times am I?